Never allow a person to ride in the luggage compartment/boot: Allowing a person to ride in the luggage compartment/boot is dangerous. 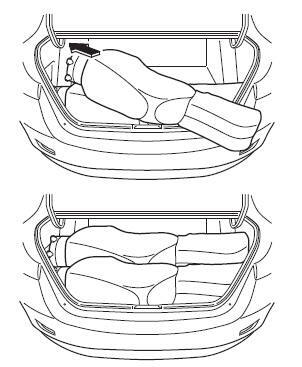 The person in the luggage compartment/boot could be seriously injured or killed during sudden braking or a collision. Do not drive with the liftgate/boot lid open: Exhaust gas in the cabin of a vehicle is dangerous. An open liftgate/boot lid in a moving vehicle will cause exhaust gas to be drawn into the cabin. This gas contains CO (carbon monoxide), which is colourless, odourless, and highly poisonous, and it can cause loss of consciousness and death. Moreover, an open liftgate/boot lid could cause occupants to fall out in an accident. Do not stack or leave loaded luggage unsecured in the luggage compartment: Otherwise, the luggage may move or collapse, resulting in injury or an accident. In addition, do not load luggage higher than the seatbacks. It may affect the side or rear fi eld of view. Before opening the liftgate/boot lid, remove any snow and ice accumulation on it. Otherwise, the liftgate/boot lid could close under the weight of the snow and ice resulting in injury. Be careful when opening/closing the liftgate/boot lid during strong winds. If a strong gust blows against the liftgate/boot lid, it could close suddenly resulting in injury. 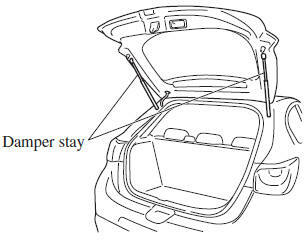 Fully open the liftgate/boot lid and make sure that it stays open. If the liftgate/boot lid is only opened partially, it could slam shut by vibration or wind gusts resulting in injury. When loading or unloading luggage in the luggage compartment/boot, turn off the engine. Otherwise, you could get burned by the heat of the exhaust gas. Be careful not to apply excessive force to the damper stay on the liftgate such as by putting your hand on the stay. 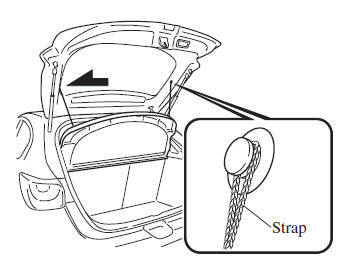 Otherwise, the damper stay may bend and affect the liftgate operation. Unlock the doors and liftgate, then press the electric liftgate opener on the liftgate and raise it when the latch releases. A locked liftgate can also be opened while the key is being carried. 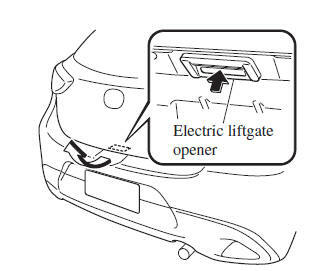 When opening the liftgate with the doors and the liftgate locked, it may require a few seconds for the liftgate latch to release after the electric liftgate opener is pressed. The liftgate can be closed when the doors are locked with the key left in the vehicle. However, to prevent locking the key in the vehicle, the liftgate can be opened by pressing the electric liftgate opener. If the liftgate cannot be opened despite doing this procedure, press the electric liftgate opener to fully open the liftgate after pushing the liftgate completely closed. When the liftgate latch is released by pressing the electric liftgate opener, the liftgate raises slightly to allow it to be opened. If the liftgate is not operated for a certain period of time after the electric liftgate opener has been pressed, the liftgate cannot be raised any more from its slightly raised position. Press the electric liftgate opener again to fully open the liftgate. To close the liftgate from its slightly raised position, open it fi rst by pressing the electric liftgate opener, then close it after waiting at least 1 second. If the liftgate is not fully closed, the driver is notifi ed by a warning indicated in the instrument cluster. If the vehicle battery is dead or there is a malfunction in the electrical system and the liftgate cannot be unlocked, the liftgate can be opened by performing the emergency procedure. Refer to When Liftgate/Boot Lid Cannot be Opened on page 7-50 . A boot lid can also be opened while the key is being carried. Press the electric boot lid opener on the boot lid, then raise the boot lid when the latch releases. 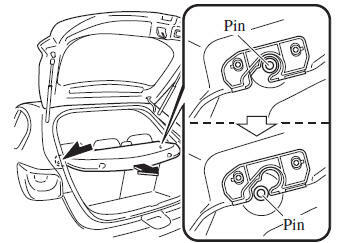 When opening the boot lid with the doors locked, it may require a few seconds for the boot lid latch to release after the electric boot lid opener is pressed. The boot lid can be closed when the doors are locked with the key left in the vehicle. However, to prevent locking the key in the vehicle, the boot lid can be opened by pressing the electric boot lid opener. 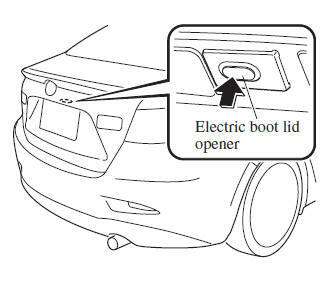 If the boot lid cannot be opened despite doing this procedure, press the electric boot lid opener to fully open the boot lid after pushing the boot lid completely closed. If the vehicle battery is dead or there is a malfunction in the electrical system and the boot lid cannot be unlocked, the boot lid can be opened by performing the emergency procedure. 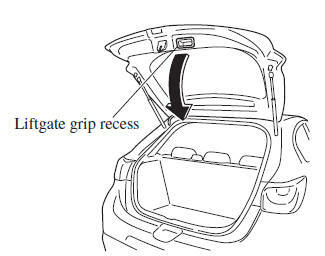 (Hatchback) Lower the liftgate slowly using the liftgate grip recess, then push the liftgate closed using both hands. Do not slam it. Pull up on the liftgate to make sure it is secure. (Saloon) Use both hands to push the boot lid down until the lock snaps shut. Do not slam it. Pull up on the boot lid to make sure it is secure. Do not place anything on top of the cover: Placing luggage or other cargo on top of the luggage compartment cover is dangerous. During sudden braking or a collision, the cargo could become a projectile that could hit and injure someone. The vehicle has a light weight luggage compartment cover to keep the contents of your luggage area out of sight; it will not retain heavy objects that are not tied down in an accident such as a rollover. Tie down all heavy objects, whether luggage or cargo, using the tie down hooks. Make sure the luggage compartment cover is fi rmly secured. If it is not fi rmly secured, it could unexpectedly disengage resulting in injury. Up to two golf bags can be carried in the boot. Place the bottom of the fi rst golf bag in the boot with its bottom pointed to the left and fi t it into the front of the boot. Place the second golf bag in the boot with its bottom pointed to the left and fi t it into the back of the boot. Some golf bags cannot fi t depending on their size.